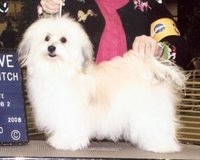 Audrey was the first Havanese we purchased to be a show dog. Through her, we learned a lot and met many wonderful Havanese breeders and owners. Now retired from the show ring and spayed, Audrey is a wonderful free spirit and beloved companion. She resides San Francisco, where she enjoys frequent walks at Crissey Field. Bred by Mary Lopez, Audrey is sired by Ch. Los Campaneros v Havaluv out of Tapscott's Isadorable. Click here for Audrey's pedigree and photos from The Winning Image.